The U.S. Fish and Wildlife Service is a government bureau housed in the Department of the Interior. The agency traces its origins back to an 1871 act of Congress that established the position of U.S. Commissioner of Fish and Fisheries, whose responsibilities included protecting the nation's supply of food fishes . In 1903, Congress created a Bureau of Fisheries within what was then the Department of Commerce and Labor. An executive branch reorganization in 1940 transferred the agency to the Department of the Interior, merged it with the Bureau of Biological Survey, and thus created the Fish and Wildlife Service. Their mission is to work with other to conserve, protect, and enhance fish, wildlife, and plants and their habitats for the continuing benefit of the American people. Today, the primary responsibilities of the Fish and Wildlife Service include managing the 376,400-square-kilometer (93-million-acre) national wildlife refuge system, operating 66 national fish hatcheries, and staffing 64 fishery resource offices and 78 ecological services field stations located throughout the United States. The agency employs approximately 8,700 trained professionals to manage these units and to enforce the nation's fish and wildlife protection laws. The national wildlife refuge system contains more than 530 individual units found in every region of the country, although most of the 93 million acres—some 77 million—are located in Alaska. A milestone in the history of fish and wildlife protection occurred in 1980, with the passage of the Alaska National Interest Lands Conservation Act. Strongly supported by former president Jimmy Carter, this congressional legislation added millions of acres to the nation's wildlife refuge system. One goal of the U.S. Fish and Wildlife Service is to conserve fish and wildlife populations, whether for sport or for the maintenance of at-risk wild populations. 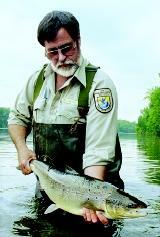 This biological technician releases a 9-pound salmon into the Connecticut River. has developed since the 1970s for maintaining and operating the system. As a result, during the Bill Clinton administration (from 1993 to 2000), Congress passed the National Wildlife Refuge Improvement Act, which is designed to provide increased federal funding for a chronically underfunded and understaffed agency. In addition to managing wildlife refuges and fish hatcheries, an equally important function of the Fish and Wildlife Service is to enforce the numerous federal fish and wildlife protection laws, including the controversial 1973 Endangered Species Act (ESA). Extremely popular with environmentalists, the ESA authorizes the Service to compile lists of threatened and endangered fish and wildlife species in the United States, and, once listed, to protect their habitats. Because these habitats can be on either public or private property, the Fifth Amendment prohibition against the "taking" of private property without just compensation has been invoked by property owners who claim their rights have been violated by enforcement of the ESA. A number of Supreme Court cases have addressed this conflict, but it persists. Bills that rewrite the 1973 act have been introduced in nearly every session of Congress in recent years, but so far legislators have not found a compromise that satisfies all parties in the dispute. The U.S. Fish and Wildlife Service promotes the conservation of native fish and wildlife populations through a variety of programs, including the Coastal Barrier Resource System, the Coastal Wetlands Conservation Grants Program, and its world-famous Duck Stamp contest. It also has helped map the nation's wetlands through the National Wetlands Inventory Program. Finally, the agency has been active in promoting instream water use so that native fish populations, especially the Pacific salmon, do not become extinct as a result of management projects that support agriculture, public water supply, hydropower development, and industry. SEE ALSO Biodiversity ; Ecology, Fresh-Water ; Ecology, Marine ; Endangered Species Act ; Fish and Wildlife Issues ; Geological Survey, U.S. ; Instream Water Issues ; National Oceanic and Atmospheric Administration ; National Park Service ; Uses of Water ; Wetlands . Cooley, Richard. Politics and Conservation: The Decline and Fall of the Alaskan Salmon. New York: Harper & Row, 1963. Simon, Benjamin, Craig Leff, and Harvey Doerksen. "Allocating Scarce Resources for Endangered Species Recovery." Journal of Policy Analysis and Management 14 (Summer 1995):415–432. History of the National Wildlife Refuge System. U.S. Fish and Wildlife Service. <http://refuges.fws.gov/history/index.html> . U.S. Fish and Wildlife Service. <http://www.fws.gov> . The U.S. Fish and Wildlife Service celebrates the 100th anniversary of the national wildlife refuge system in 2003, thus commemorating President Theodore Roosevelt's 1903 bold action establishing Pelican Island, off the coast of Florida, as the nation's first refuge. Roosevelt, a dedicated conservationist and avid sportsman, created several more refuges before leaving office, and subsequent presidential administrations and congresses have further enlarged the system.